BELIZE CITY, Mon. Oct. 2, 2017–The government will hire two retired judges from the Caribbean to assist Chief Justice Kenneth Benjamin with his backlog of cases, some of which date back to about five years ago. Prime Minister Dean Barrow made the announcement last Thursday at a press conference at the Best Western Biltmore Hotel. “…the Chief Justice has agreed to accept assistance from two retired judges from the Caribbean. 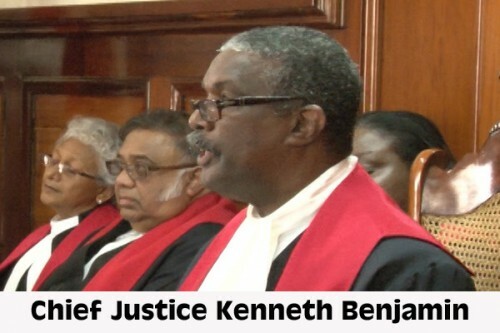 These are persons found by Sir Dennis Byron, the president of the CCJ, assistance that we have to pay for, of course, but that’s not really an issue,” Barrow said in his answer to a question about the matter of the delayed judgment. Barrow went on to explain that the government is not totally broke, that it can afford to take care of this necessary requirement to keep the ship of state afloat. “We are not nearly as broke as you people seem to think, you know … with the advent of those two judges to assist the Chief Justice, I am extremely confident that he will then be able to clear up this backlog by the point in time, in December,” Barrow explained. It was not until the Bar Association of Belize passed a resolution which called on the Chief Justice to commit to a timeline for clearing off the backlog that the matter made it into the public domain. If the CJ cannot keep the timeline for delivering judgment on his backlog of cases, he should be removed for “misbehavior in office,” the Bar Association said. The Chief Justice has around 30 judgments spanning a period between two to five years, up to 2015. Chief Justice Benjamin, a native of Guyana, was appointed as Chief Justice of Belize on September 15, 2011. Prior to his taking office, Benjamin, who has been on the bench for some 17 years, had served as Chief Magistrate in Antigua and Barbuda, and as a former High Court Judge on the Eastern Caribbean Supreme Court. He also served as judge in the High Court of Saint Lucia in the Criminal Division. Benjamin replaced Chief Justice Abdulai Conteh, whose contract was not renewed by the Government of Belize when he reached the constitutionally prescribed retirement age of 65 years.